Among Rubens’ works devoted to religious subjects, the representation of saints plays an important role. Rubens created an artistic language fully adapted to the Counter-Reformation movement, which stressed the heroic, emotional and ascetic aspects of the saints’ lives. This depiction of St. Ignatius of Loyola was painted for the mother church of the Jesuit order in Rome, Il Gesù. 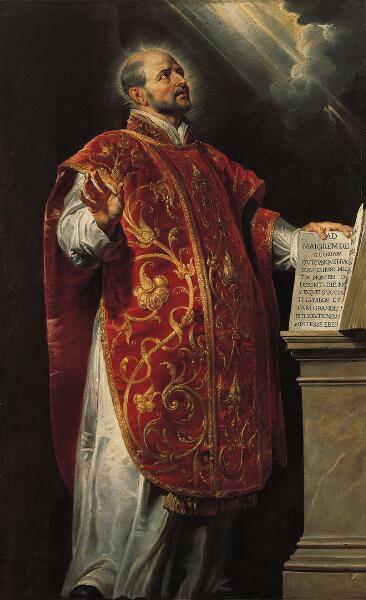 The founder of the Jesuits wears a brocaded chasuble and gazes ecstatically to the viewer’s right, where beams of heavenly light break through the clouds. His right hand is raised in a gesture of admonition; his left hand holds a copy of the Constitutions of the Society of Jesus, with a page open to their famous motto: “To the greater glory of God.” Ignatius, painted to be seen from below, is presented as a Christian hero, full of Baroque sentiment designed to strengthen worshippers in their belief and spur them to emulation. Il Gesu (Church of the Jesuits), Rome, until the late seventeenth century. George Greville, 2nd Earl of Brooke and Warwick, by 1798. This imposing holy man seems lost in contemplation. But tears are streaming from his eyes. We are witnessing a moment of religious ecstasy. This painting, by the 17th-century Flemish master Peter Paul Rubens, was created at a time when the Catholic Church was rising to the challenge of the Protestant Reformation. One strategy to keep the faithful in the fold was to encourage artists to make religious experience more accessible through their paintings. Here, the subject is Saint Ignatius of Loyola, founder of the Jesuit order. When this picture was painted, about 1616, he had only recently achieved sainthood. He is identified by the opening words in the book he holds: “To the Greater Glory of God”: the Latin motto of the Jesuits. With his brush, Rubens carves out the strong illusion of the saint standing in space above us, communicating with a force on high. He is so close and so vivid, we sense the heavy stiffness of his brocade robe. Using bravado effects of foreshortening, Rubens makes Loyola’s hand… the edge of the book… and even the toe of his shoe, appear to reach out of the picture into our space, as if we were actual witnesses to this moment of epiphany. The saint’s tears, by the way, are no invention. According to one of his followers, St. Ignatius considered himself “deprived of consolation” if he did not weep three times during Mass.